Adjacent to the new secretariat and also called the Rustomji Park named after one of the Dewans of the Chogyal of Sikkim, the park has a big open enclosure in which animals native to Sikkim like the red panda and the Himalayan Bear are kept. A big statue of Lord Buddha commemorating his preachings of the noble truths in the Deer Park at Sarnath adorns the park premises. A butter lamp perpetually burns in front of the statue, which is surrounded with flowers of exotic variety. The park commands a fantastic view of the hills, surrounding Gangtok. 25-km from Gangtok, just before Phodong is Kabi Longstok. There is a spot amidst tall trees, where the treaty of brotherhood between, the Lepcha Chieftan - Tetong Tek and the Tibetan chief Khye Bhumsa was signed. Crossing a check gate where visitors entry permits was checked, one enters the Kangchendzonga National Park. The climb is gradual but very interesting as soon one is greeted by snow, lying white and pristine over the green forest floor and covering a few treetops. The jagged, rocky slopes to our left glistened in the sunlight at places forming glaciers where the gradient was right. The mountains to our right were covered with dark green pines; the snow line being much higher. A 24-km drive from Gangtok, through the beautiful, bewitching countryside leads one to Rumtek. 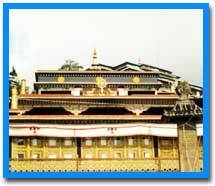 Rumtek, is the seat of the Karmapa Lama who heads the Kagyupa Sect of Buddhism. 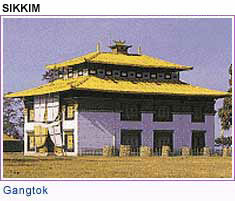 The Royal Chapel, Tsuklakhang, is within the palace grounds. Popularly called Tsulakhang Royal. 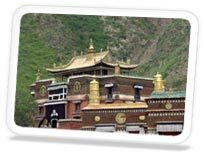 It is the principal place of worship and assembly and the repository of a vast collection of Buddhist scriptures. The ridge is a small stretch of plain and flat road above the town of Gangtok. It is just about five minutes walk from the main market. The ridge has the white hall and the chief minister's official residence on one end and the beautifully designed palace gate on the other. The ridge is lined with plants and trees when in bloom are a riot of colours. Flower shows, which attract tourists from all over the world are held just below the ridge. Tsomgo literally means "Source of the Lake " in Bhutia language. ' TSO' means lake and ' MGO' means head. At about 40-km away from Gangtok, this serene and holy lake is situated at an altitude of 12,400 ft on the Gangtok - Nathu La highway. 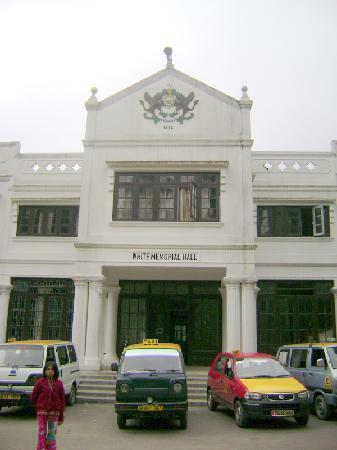 It was built in 1932 in memory of the first political officer of Sikkim, Claude White. There is an Officers Club and a Badminton Court in the white hall. With an average depth of 50 ft, this lake is situated 35 km from Gangtok at an altitude of 12,000 ft on the Gangtok - Nathu-la highway. Recently this lake has been opened for tourists. Its cool, placid water is in the perfect harmony with the scenic beauty around. A small temple of Lord Shiva is constructed on the lakeside. Primulae flowers and other alpine vegetation grow wild around the lake. The department of Tourism conducts package tours to this lake. Cameras are not allowed to carry on this route. A little distance from the lake is a beautiful natural three storeyed cave, the Tseten Tashi cave is a worth to visit. Another typical called "Tung" and then one will reach Chungthang. 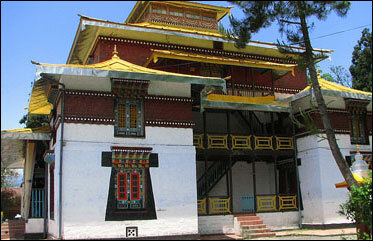 Chungthang is a small habitation in a cup like valley, surrounded on all sides by towering hills. Though its altitude is only 500 ft, it is much colder than Mangam. The heavy, cold air remains slumbering in he valley till late morning. It is only when the sun is high up in the horizon and its warm rays pierce deep into the valley that the lazy, cold wind and mist slowly depart. 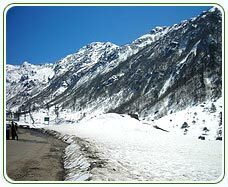 The main importance of this place is that it is at the confluence of two valleys and two main rivers of north Sikkim: the Lachung Cho and the Lachen Cho, the latter commonly known as the Teesta. We would be following the Lachung Cho for the next part of the journey. 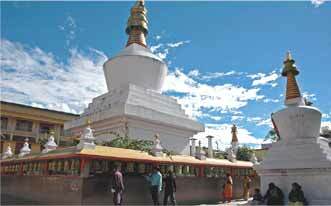 To the Sikkimese and the members of the Indian Army, Chungthang is a place of major religious significance. The Sikkimese believe that guru Padmasabhava had rested in this place and left three footprints for his devotees on a solid piece of rock. The guru also scattered some rice on an adjacent land, where till today, notwithstanding the height and the cold, paddy is grown efforts to replicate this phenomenon in adjacent fields have reportedly failed The Sikh members of the Indian army believe that the footprints are those of Guru Nanak and so also are the main figures in the wall paintings inside the nearby monastery. 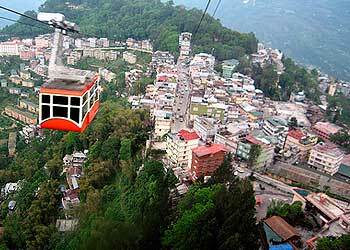 It is situated on a ridge and is only 7-km from Gangtok. From this spot one gets birds view of sprawling Gangtok town down below while across the hills Mt. Khangchendzonga and Mt. Siniolchu loom over the horizon. A cafeteria serves hot tea/coffee and snacks. It is 11-km from Gangtok town, above Ganesh Tok with a Hindu temple where the devotees come and offer prayers. Menmecho Lake lies 20-km ahead of Changu Lake, cradled between the mountains below Jelapla Pass, is the source of River Ranpochu, which meets Teesta at Rangpo. It is rich in trout. A Dak Bungalow and a tourist lodge are available for overnight stay. 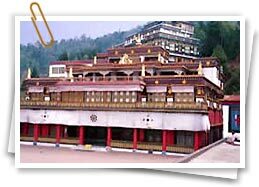 This monastery is located about a kilometre above the North Sikkim Highway about 40-km away from Gangtok. Chogyal Gyurmed Namgyal built the monastery sometime in the first quarter of the 18th century. 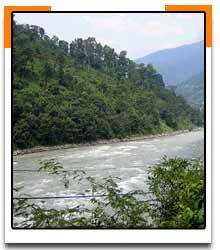 Situated along the North Sikkim highway it is only 8-km from Gangtok. From this point one can get a breathtaking view of Mount Khangchendzonga and Mt. Siniolchu, one of the most graceful peaks in the world. This 6 acres garden is about 14-km downhill from Gangtok and 2-km from Ranipul. It is named after the plant Ipecac that is grown here. Besides this plant, it also contains a wide variety of other flora including numerous types of orchids and medicinal plants. It is a very good picnic spot with a swimming pool nearby. Yumthang is a valley at 12,000 ft. Its location is awesome. Nature is at her expressive best. Snow clad mountains all around looking down on this high valley full of colour. The valley floor is covered with wild, yellow flowers and violet Primulas, while the hill sides are vivid and glowing with multicoloured Rhododendrons. The best part about travelling in Sikkim is that even while one is travelling one is actually passing through beautiful places. Each place could be the destination for a lovely ethereal holiday. At an altitude of 12,000 ft, 135-km from Gangtok in north Sikkim, a few hundred metres off the road, after crossing river Lachung over a pedestrian bridge lies these Sulphur springs. There is a hut with two pools for bathing. The main markets for shopping are Old market, New Market and Lal market. Here one finds shops of all kind, which offer good range of items to be purchased. For tourists there are many attractive items to be bought as carved furniture, the dresses, Lepcha weave bags, Carpets & Durries with intricate designs and colourful decorations. One can also buy wooden and bamboo artifacts. For a collector of handmade decorative pieces Gangtok is a paradise. The items from Gangtok leave a long lasting impression on the mind of the visitor. The Hindi speaking Marwaris dominates many of the shops in the Gangtok market. The handicraft and handloom directorate office and the showroom are on crossing of MG Marg and New market. The Gramin Vikas Agency showroom is also located here. In these showrooms one can buy carpets, masks, bright Choktse tables, Thanka hangings. The nearest railhead is at New Jalpaiguri, which is 125-km (about 4 hours drive) from Gangtok. 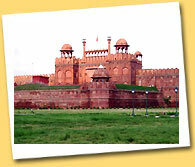 NJP is well connected with all major cities of India. Gangtok, railway bookings can be made at the booking counter of the Sikkim nationalised transport terminus. Gangtok is connected with Darjeeling, Kalimpong and Siliguri by the national highway 31 A. the Sikkim nationalised transport plies regular bus services between Gangtok and Siliguri and within Sikkim. Private buses, jeeps and taxis are also available from Siliguri and Bagdogra. Bookings can be made at the SNT terminus, Siliguri. Gangtok has quite good hotels for a comfortable stay. 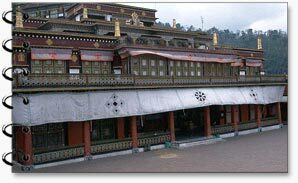 There are youth hostels and various lodges, which give tourists a comfortable stay in Gangtok.